First we want to recognize the “birthday” of the Nagle Warren Mansion. Completed in 1888, it is a youthful 124 years old this month. We consider ourselves lucky to be a part of it. Charlie was one of Cheyenne’s more colorful characters. He was a massive man weighing in at over 500 pounds (We viewed a pair of his overalls is in the museum and Jim could easily fit inside each pant leg.). Originally from Missouri, he was a rancher, rodeo cowboy and showman. 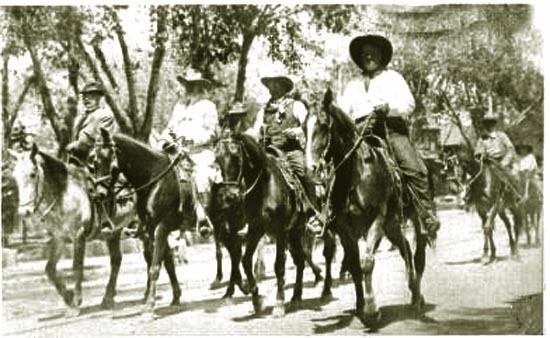 Active in Cheyenne Frontier Days (CFD) parades and rodeos, Charlie provided the rodeo stock and organized the Sioux and Cavalry presence in early Frontier Days events. In 1906, he won the CFD steer roping championship. Charlie established The Irwin Brothers Wild West Show which traveled the country, much like Buffalo Bill Cody’s Wild West Show from 1913 to 1917. One of his horses, Steamboat, is said to be the horse depicted on Wyoming license plates. While Mr. Irwin worked hisY6 ranch and traveled with The Irwin Brothers Wild West Show, his wife wanted to raise the children in town where they would be exposed to more civilizing influences. Interestingly, Charlie had three daughters who became trick riders and cowgirls who performed in his traveling show. There’s no record of what Mrs. Irwin may have said about that. His one son was more interested in a career with the circus. Charlie and his wife Etta also raised 17 other children from the “orphan trains” that ran through Cheyenne. In later years Charlie was known for his stable of racing horses and he participated in the creation of a number of race tracks from Nebraska to California. Charlie was the one who gave Tom Smith, trainer of Seabiscuit, his first job as a horse trainer. Perhaps one of Charlie’s more interesting accomplishments was that he sang the popular cowboy song “Life’s Railway to Heaven,” at the hanging of the legendary Tom Horn. It seems there was not a dry eye in the house. Charlie met his demise in a car accident. It’s said a tire on his specially built vehicle blew because of his weight. In wandering the historic district just north of the capitol building in Cheyenne, you can still see Charlie’s large horse barn. Jane…. This was so interesting! What a great story 🙂 Frontier Days will be amazing, and keep you “hopping” with guests and activities!! Can’t wait to visit the Mansion one of these days!! Happy 124 years to the beautiful Nagle Warren Mansion, and many many more! !